Added on 21 April 2017 . By Katie Houghton. Indian dining in London, we all know it's at its peak, but who's cuddling the crown when it comes to some of the best restaurants in the city? Having already been to Cinnamon Bazaar recently, and putting in a bid to marry their samosa chaat, it was right about time that I made my way down to one of the biggest names in the Cinnamon dining group, and that was Cinnamon Kitchen. If you know anything of London, you know the suit-led bustle Liverpool Street. Hidden on the back streets past a street-spilling pub, it's Devonshire Square that hides Cinnamon Kitchen amongst its myriad of City friendly restaurants. While i'm, of course, always out of place in a leather jacket where tailored trousers reign supreme, Cinnamon Kitchen may clearly cater to the surround business, but this is a restaurant that's clearly hospitable to one and all. 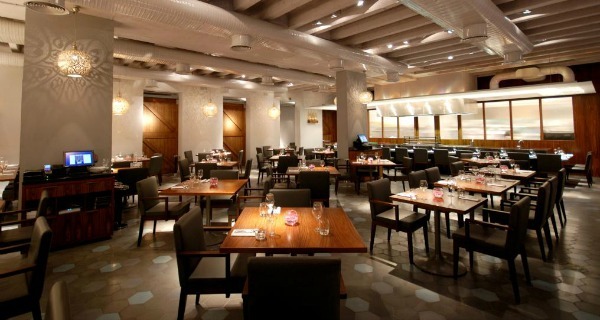 Simple, clean and uncluttered, Cinnamon Kitchen is a prime example of elegant Indian dining. While modest dining tables filled the space and humble colours support the tone of the night, Cinnamon Kitchen doesn't lose its Eastern touch, with glittering lanterns adding decorative Indian silhouettes to the relatively stark walls. I do wish the space had been a little darker and broodier as we had an engagement to celebrate, but it seems the after-work crowd wins out at Cinnamon with a bright, office resonance. While the dining space is simple, it only owes itself over to the stand-out plates. It's safe to say that I haven't ever had a bad Indian meal in London, and I think the Cinnamon brand is partly down to this. I hadn't however seen what their biggest name could produce. Starting on a simple house white to support, what we were hoping, would be the explosive spices and flavours of our meal, Cinnamon from the off provided a waitress that I adored the world over. Friendly and engaging, she helped with plates, showed a clear love of the cuisine, and asked us about ourselves without being intrusive. As two vegetarians, Cinnamon Kitchen was clearly the place to be. Starting on the Bombay street food with steamed chickpea cake, papdi chaat, and dabeli at £7.50, they showed why. Ranging in texture, bringing savoury to the forefront of the dish and adding a sweet element to the starter, not only do I think this is a steal at just under £8, this is a great way to highlight some of the alternative spices in Indian dining. Our second starter was also something to write home about. An Indo Chinese stir-fried chilli paneer at £7.00, this sticky and rich mix refused to taste vegetarian, adding a thick and meaty texture that brought out the subtlety of the paneer with literal finesse. Continuing on our meat-free quest, I opted for the Tandoori Trio with paneer tikka, achari cauliflower, Padrón pepper at £15.50, while my boyfriend tucked into the grilled portobello mushroom with spinach and garlic at £16.50. Choosing another dish that gave me a broad idea of what Cinnamon Kitchen could conjure, I once again fell in love with their paneer textures, also loving the flavour of the achari cauliflower as it was perked up by the lightly toasted pepper. Service stayed strong at Cinnamon Kitchen, as our final dishes showed. While we couldn't actually muster the courage to order dessert ourselves, my boyfriend turned the ultimate scamp as I headed over to the bathroom. Telling the servers not only of our recent engagement but my birthday, they not only brought out two comped glasses of Champagne, two chocolate cakes emblazoned with special notes came too. 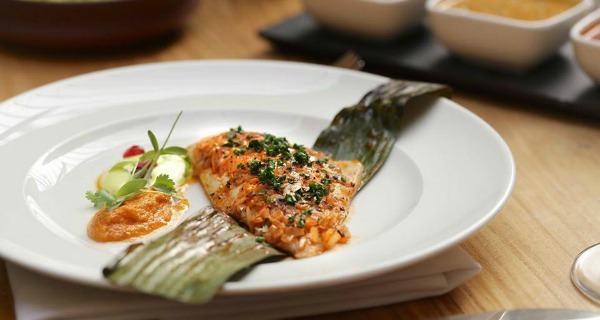 Cinnamon Kitchen offer Indian artwork on a plate with their creative dishes. I'm a massive fan of the little things, you need only see my attitude around a puppy to get that, and Cinnamon Kitchen too know why these matter. Not only making our visit special with cutesy, celebratory cakes, Cinnamon Kitchen's attitude to Indian dining is fresh, it's inviting and it's a homage to the East that's almost incomparable in the city. I don't really think you'll come across a better brand than the Cinnamon Group any time soon.